It is Snowpiercer’s world, and we are just living in it. BONG Joon-ho’s latest work reached four million domestic viewers as of 16:00 August 6th, as announced by CJ Entertainment. This record was established within seven days of its release on the 31st of last month. The record of the fastest to reach four million viewers used to be eight days, and was previously held by Transformers 3 (2011), The Thieves, Iron Man 3 and Secretly Greatly, but now Snowpiercer has replaced them by cutting out one more day. The film also clinched the highest weekend figure (from Friday to Sunday) for a Korean film after recording 2.26 million viewers, ahead of the previous record of 2.06 million set by Secretly Greatly earlier this year. Before release, the box office forecast of this film was uncertain despite having every reason to be the hottest movie of the year, since it boasts the biggest budget ever for a domestic film (USD 39.6 million) and features Hollywood stars such as Chris Evans, Tilda Swinton and Ed Harris. However, the narrative was seen as very dark and heavy for a summer blockbuster, raising concerns as to whether it would appeal to a general audience. It was also pointed out that the computer graphics left something to be desired. However, all these controversies seem to have stimulated movie-goers’ attention. Their faith in BONG, the auteur behind Memories of Murder (2003), The Host (2006) and Mother (2009), who has accomplished success both in artistic and commercial aspects, was firm. Meanwhile, the downfall of Mr. Go by KIM Yong-hwa, which was previously expected to be among the big names this summer, also played a part in the box office victory of Snowpiercer. In addition, the timing was perfect. Snowpiercer was released on the very day when the record long rainy season in Korea had just ended and the notorious hot climate began. The landscape of snow and the introduction of a New Ice Age in the narrative made this film a very attractive “knock the heat” movie, which was very appealing for audiences. No obstacles are present in Snowpiercer’s ongoing box office race. First off, there is no meaningful competitor. R.I.P.D. and Elysium are the only Hollywood blockbusters that will be released in August. While local thrillers Flu by KIM Sung-soo and Hide and Seek are in the line-up for August 14th, they don’t look like significant box office contenders to the unstoppable Snowpiercer. 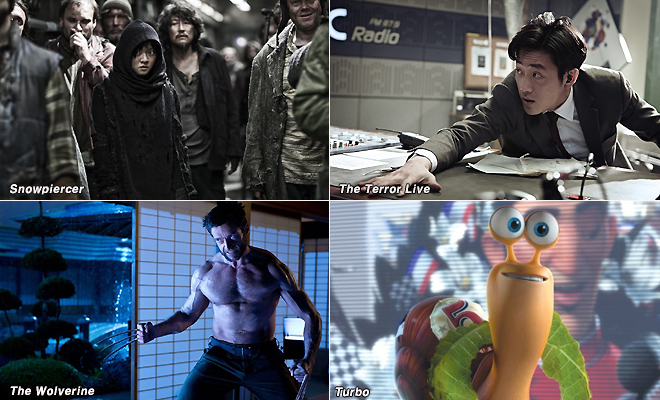 While Snowpiercer is a clear winner, The Terror Live, featuring HA Jung-woo, is also performing very strongly. 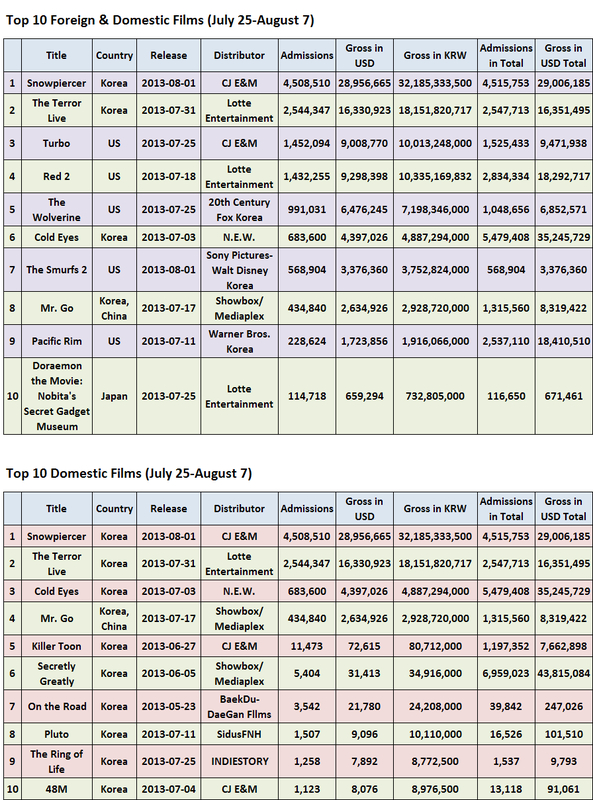 According to the online ticket counting system at the Korean Film Council (KOFIC), The Terror Live attracted 248,330 viewers from 724 theater screens nationwide on August 5th, hitting two million accumulated viewers in the six days since its release. With a very modest budget of KRW 3.5 million, which is barely one tenth of that of Snowpiercer, The Terror Live has performed remarkably well in the box office race and already hit the break-even point during its first week of release. These two movies seem to be working together in the same way that Haeundae and Take Off both became big hits around the same time in 2009. The fearsome box office race among domestic movies has left very little room for foreign films. The best performance was achieved by The Wolverine featuring Hugh Jackman, which was released one week before Snowpiercer and has attracted one million viewers so far. Red 2, with Bruce Willis, Catherine Zeta Jones and LEE Byung-hun, has reached 2.75 million accumulated viewers, beating the performance of the first Red, which attracted less than 500,000 viewers in 2010. Dreamworks’ Turbo and Sony Pictures’ Smurfs 2 have appealed to family audiences and earned accumulated viewers of 1.38 million and 430,000, respectively. Among low-budget independent films, SHIN Su-won’s Pluto and On the Road, an independent documentary about female monks, are proving meaningful performers. Pluto, which earned the Jury’s Special Mention in the Generation Section at the 63rd Berlin International Film Festival, has been shown to almost 20,000 viewers so far and LEE Chang-jae’s On the Road has been on the screen for more than 11 weeks, attracting an accumulated 36,000 viewers to date.